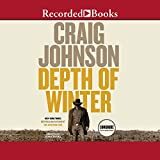 Depth of winter / Craig Johnson. By: Johnson, Craig, 1961- [author.]. Material type: SoundSeries: Johnson, Craig, Walt Longmire mystery: bk. 15.Publisher: Prince Frederick, MD : Recorded Books, Llc, 2018Edition: Unabridged.Description: 7 audio discs (465 min.) : digital ; 4 3/4 in.Content type: spoken word Media type: audio Carrier type: audio discISBN: 9781980008002; 1980008000.Subject(s): Longmire, Walt (Fictitious character) | Longmire, Walt (Fictitious character) -- Fiction | Fathers and daughters -- Fiction | Assassins -- Fiction | Kidnapping victims -- Fiction | Sheriffs -- Wyoming -- Fiction | Cartels -- Mexico -- Fiction | Kidnapping -- Mexico -- Fiction | Mexico -- Fiction | FICTION / Mystery & Detective / General | Assassins | Kidnapping victims | Mexico | FICTION / Mystery & Detective / Police Procedural. Named Person: Longmire, Walt (Fictitious character) -- Fiction. Genre/Form: Detective and mystery stories. Audiobooks. FICTION / Mystery & Detective / Police Procedural. Named Person: Longmire, Walt (Genre/Form: Audiobooks. | Detective and mystery fiction. | Mystery fiction. | Audiobooks. | Detective and mystery fiction. | Fiction. | Audiobooks.DDC classification: 813/.6 Online resources: View cover art Narrated by George Guidall.Summary: Welcome to Walt Longmire's worst nightmare. In Craig Johnson's latest mystery, an international hit man and the head of one of the most vicious drug cartels in Mexico has kidnapped Walt's beloved daughter, Cady, to auction her off to his worst enemies, of which there are many. The American government is of limited help and the Mexican one even less. Walt heads into the one-hundred-and-ten degree heat of the Northern Mexican desert alone, one man against an army. Welcome to Walt Longmire's worst nightmare. In Craig Johnson's latest mystery, an international hit man and the head of one of the most vicious drug cartels in Mexico has kidnapped Walt's beloved daughter, Cady, to auction her off to his worst enemies, of which there are many. The American government is of limited help and the Mexican one even less. Walt heads into the one-hundred-and-ten degree heat of the Northern Mexican desert alone, one man against an army.